Just Strong is a lifestyle brand for strong women with an ecommerce store selling Activewear designed to empower & motivate women to Be Strong. They offer the women the opportunity to become a Just Strong Ambassador and “empower other women to be strong” and to benefit from discounts and an affiliate link. 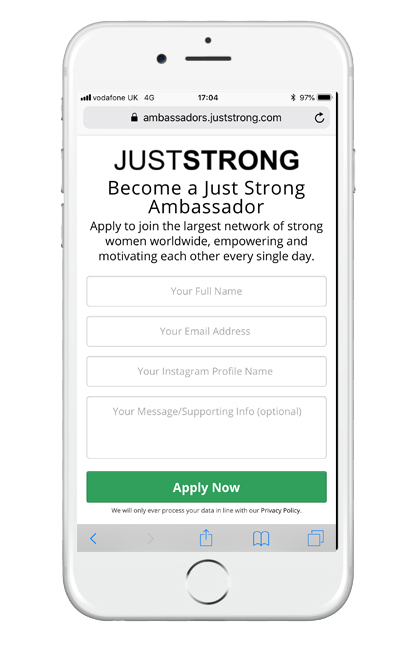 The owner of Just Strong, Mark Robinson was searching for a Digital Marketing Agency to identify and implement changes to his Ambassador Optin Funnel. Mark contacted us through a private Facebook Group of Marketers. To redesign and optimise the Ambassadors Funnel and the welcome email in order to improve the user experience and increase sign ups to become a brand ambassador, increase sales of the clothing and growth of the closed group. Discovery – through a process of worksheets and meetings we gathered all the information we needed to have the best understanding of Mark’s business and goals. Architecture – just like a building, a website or funnel needs a solid blueprint so we created a funnel flow diagram. Content – with a solid blueprint in place we collected, organized, edited, and delivered content for each page of the funnels and their associated emails. We joined the Facebook Group to find out more about the existing ambassadors and discover the conversations they are having within the Group, to help us write copy for the pages and for the email campaigns. Design – at the same time as working on content we created the look and feel of the funnels. We Carried out research, looking at ideas for funnel designs from similar or related companies, targeting a similar group of women. We designed the landing and thank you pages ensuring brand consistency. With most of their visitors using a mobile phone, we optimised the pages for mobile users. Launch – getting the funnel “go live” ready inevitably requires several rounds of revisions and polish. Once they are ready, we went through the final launch checklist… and Launched. ClickFunnels – ClickFunnels is the ultimate funnel creation software on the market… Using Click Funnels enables us to build and deliver highly credible, fully responsive, professional looking funnels that can help you boost your leads. Klaviyo – This email marketing platform used by our customers does not integrate directly with ClickFunnels but we were able to connect the 2 by using Zapier. Zapier – Zapier is a tool that allows you to connect apps you use every day to automate tasks and save time. Hotjar – We use Hotjar for heatmaps and recordings. It integrates nicely with ClickFunnels and we start off with the free version and if you like the results you can upgrade to a paid version to collect additional data. Google Apps – We use Google Sheets to keep track of all the moving parts of a project. This allows for comments and questions all within the project document. We use folders in Google Drive where assets can be uploaded by both the client and Make Digital Work. This keeps everything in one place and keeps the project on track. The Welcome email produced a 69.1% open rate, with a 36.7 click through rate, resulting in 5 figure sales in the first month.